Each one of the cardinal directions has a corresponding color - each color has a symbolic meaning. Shamans/ Spiritual guides used the knowledge of these symbolic colors to invoke the spirit whose characteristics was needed for his formulas. The Red Man, living in the East, is the spirit of power, triumph, and success. The Black Man, in the West, is the spirit of death. The shaman/ Guide would invoke the Red Man to the assistance of his patient and consign his enemy to the fatal influences of the Black Man. 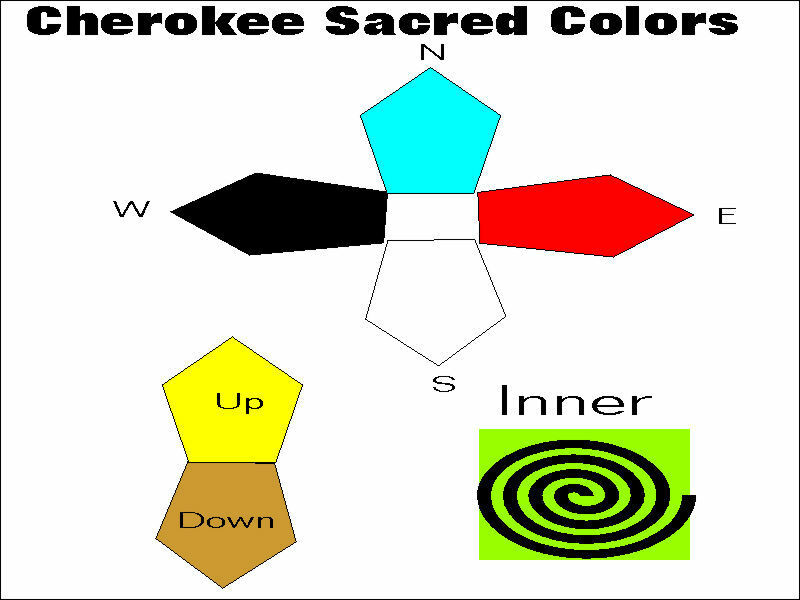 According to Thomas Mails, in his book, "Cherokee People," the mythological significance of different colors were important in Cherokee lore. Red was symbolic of success. It was the color of the war club used to strike an enemy in battle as well as the other club used by the warrior to shield himself. Red beads were used to conjure the red spirit to insure long life, recovery from sickness, success in love and ball play or any other undertaking where the benefit of the magic spell was wrought. Black was always typical of death. The soul of the enemy was continually beaten about by black war clubs and enveloped in a black fog. In conjuring to destroy an enemy, the priest used black beads and invoked the black spirits- which always lived in the West,-bidding them to tear out the man's soul and carry it to the West, and put it into the black coffin deep in the black mud, with a black serpent coiled above it. Blue symbolized failure, disappointment, or unsatisfied desire. To say "they shall never become blue" expressed the belief that they would never fail in anything they undertook. In love charms, the lover figuratively covered himself with red and prayed that his rival would become entirely blue and walk in a blue path. "He is entirely blue," approximates meaning of the common English phrase, "He feels blue." The blue spirits lived in the North. White denoted peace and happiness. 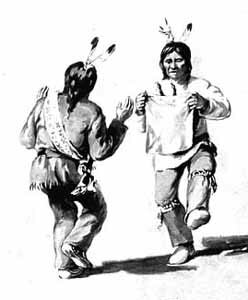 In ceremonial addresses, as the Green Corn Dance and ball play, the people symbolically partook of white food and, after the dance or game, returned along the white trail to their white houses. In love charms, the man, to induce the woman to cast her lost with his, boasted, "I am a white man," implying that all was happiness where he was. White beads had the same meaning in bead conjuring, and white was the color of the stone pipe anciently used in ratifying peace treaties. The White spirits lived in the South. Remember that you have a sacred color assigned to you through your birth date power animal. This color correspond with one of the 7-directions. This color must be part of your totems in your medicine pouch.